Bad weather occurred in Bali today. January 27, 2016, at about 2:40 pm, a storm in Bali. Angon the piece flew a lot of leaves and rubbish. Fallen trees middle of the road, causing traffic jams. Hurricanes occurred approximately 20 minutes, making all those concerned with the threat of natural disasters. Bali feels tense with weather conditions like this. Very scary if you are outdoors. In the area of ​​West Bali, hurricanes hit all the existing trees on the roadside. Many trees uprooted, roads become difficult to pass. In coastal areas, the beach becomes a horrible place with sea waves suddenly become very big and tall. People who live in the area pensisir became very scared. Takun in case waves like tsunamis. 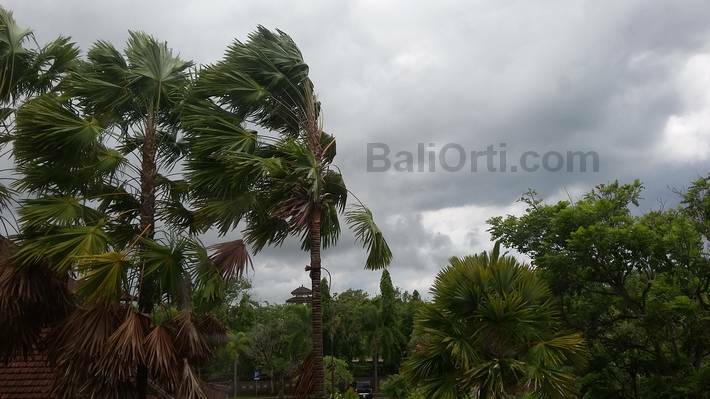 A cyclone accompanied by heavy rains in Bali today is very big. People move a vehicle in the parking under the trees. They fear that if a tree falls and hit the vehicle. In the traditional market traders became very panicked. Stalls, which uses plastic as a shade tarp and become damaged and fluttering in the mounting of strong winds.